Special Offer: There is an Open XML Bundle that includes everything at a discounted price! Get it here. The reference manual is composed of a PDF explaining the concepts, and (lots and) lots of source code to demonstrate those concepts. The resulting Excel files are also packaged together so you can do your own comparison. Source code is written in C#. 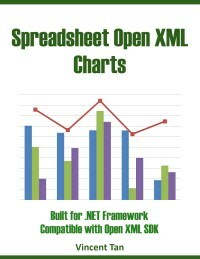 You can get Spreadsheet Open XML Charts for USD 35. As part of your purchase, you get 1 year of technical support. After your purchase, you will be directed to a web page where you can immediately download the reference manual. Within 1 year of your purchase, if you’re not satisfied with the reference manual, just let me know and I’ll give you a full refund. No questions asked. There is an Open XML Bundle that includes everything at a discounted price! Get it here.